This year The Vinery Team are getting involved with Kirkwood Hospice and their Make A Difference Day! 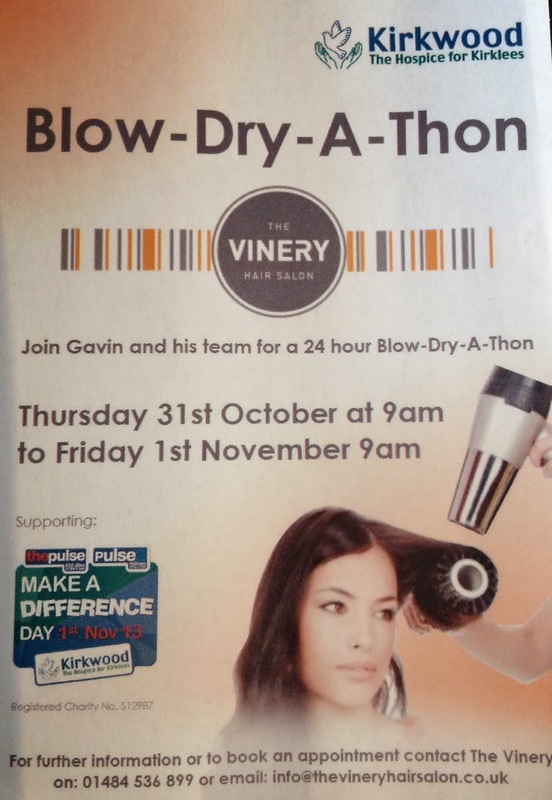 The Vinery Hair Salon will be holding a 24-hour Blowdry-A-Thon, offering complimentary blowdry's in exchange for a donation to Kirkwood Hospice. The Salon Blowdry-A-Thon starts at 9am on Thursday 31st October and runs through the night, finishing at 9am on Friday 1st November 2013. We want as many people as possible to book in for the Blowdry-A-Thon so please spread the word and feel free to book yourself in! It's a great excuse for a spot of pampering and a boost to your karma in aid of a great cause! Kirkwood Hospice have organised Make A Difference Day which will be held on 1st November and various events will be taking place at the Hospice including a raffle, Bucking Bronco and we hear that members of their team are even doing a sponsored sky-dive! Kirkwood Hospice have partnered up with Pulse and Pulse2 Radio to raise as much money as possible to continue the fantastic work the Hospice carries out caring for patients and families who use their service. To get involved yourself or to catch up on the progress of our Blowdry-A-Thon keep checking our blog!